North-West University (NWU) academic Prof Emmanuel Mukwevho spoke candidly about his research overview that focuses of finding therapeutic agents for obesity, diabetes and metabolic syndrome during his inaugural lecture held at the campus in Mahikeng on 15 August 2018. “My research looks into the chromatin as a centre where events occurs within a cell,” said Prof Mukhwevho. “Food with high fat and high sugar content and our lifestyle activities have a huge impact on our genes. These genes perform various functions in a cell to protect us from various ailments associated with our diet and lifestyle activities. Prof Mukwevho’s research has shown exercise increases these genes, resulting in key proteins and enzymes being upregulated. The upregulation at protein level increases sugar entering the cell instead of building up in the blood. Prof Mukwevho’s research interest is obesity, diabetes and metabolic syndrome, with a specific focus on molecular pathways and signalling molecules. 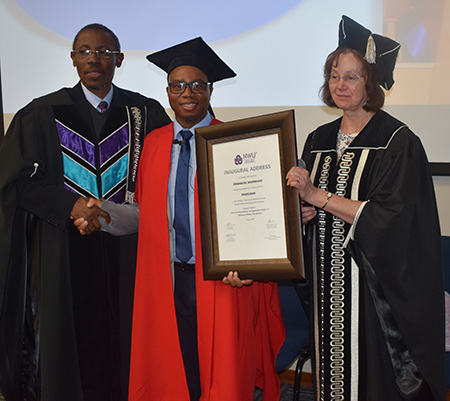 Prof Mukwevho has been with the NWU for three years, and has already produced 15 BScHons graduates, seven MSc and three PhDs through an existing collaboration with Prof Kennedy Erlwenger. He has also mentored four postdoctoral students. Prof Eno Ebenso and Prof Helen Drummond congratulate Prof Emmanuel Mukhevho (in the middle) after his inaugural lecture.